property description: Enjoy your Granada vacation! 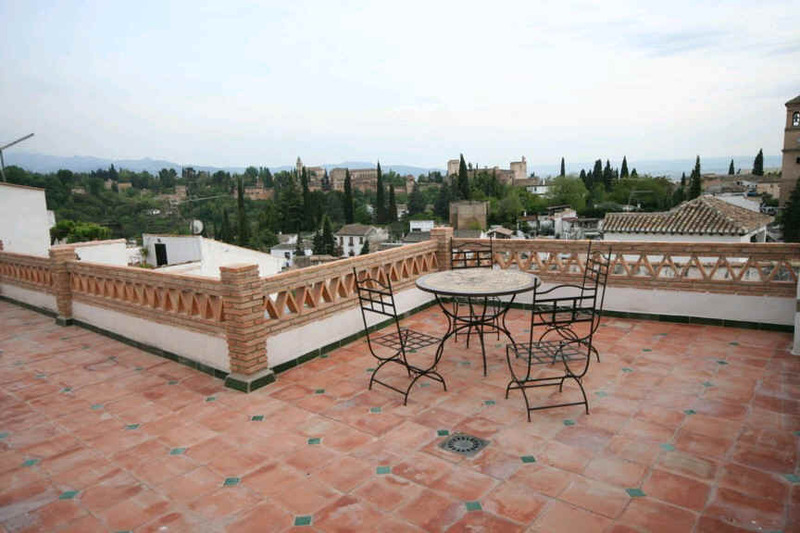 Stay in beautiful holiday apartment and house rentals in the historic Albaycin district, City of Granada, Andalusia, with broad vistas of the Alhambra Palace, Generalife, and Sierra Nevada mountains. Centrally located in the upper Albaycin near El Salvador Church, Plaza Larga with its cafes and restaurants, San Miguel Park, Sacromonte (home of flamenco shows & classes), and the culturally-rich surroundings of this exquisite UNESCO World Heritage Site, these upscale flats and house rentals provide for a complete self-catered vacation. Arrange lodging at spacious Casa Azahar, including two different apartment options (one- and two-bedroom flats) both with access to a professional kitchen. Neighboring at Calle San Luis is a charming small house with 3 bedrooms, kitchen, and terraces. Alhambra Vistas is a member of Canticum Hotels and Casa Azahar a sister to the Inn at Coyote Mountain (Costa Rica) and Trout Point Lodge (Canada), assuring you of the highest quality accommodation and vacation apartment experience. 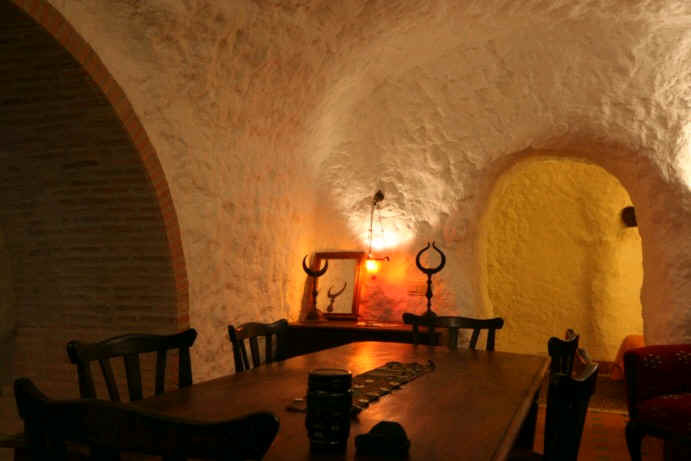 We can also arrange cooking lessons at the adjacent Mediterranean Cooking School as well as language, flamenco, history, and culture classes in the vicinity. Excursions to Seville, Cordoba, Cadiz, and Ronda are available on request. Combined language, culinary, and culture classes can be arranged at the nearby Renaissance city of Ubeda, in cooperation with Abadat Spanish Language School. We can also assist with travel arrangements, Alhambra tickets, Spanish language instruction, and recommend other apartment rentals in the Albaycin. 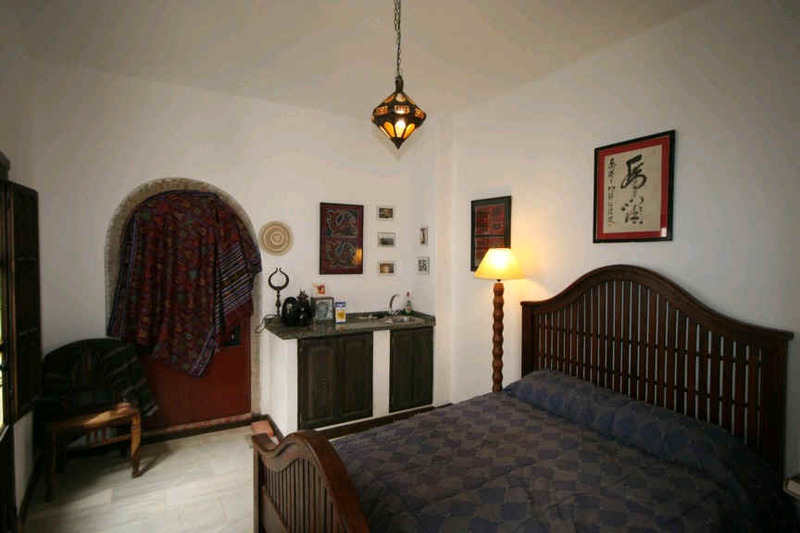 Casa Cueva apartment with 2 bedrooms (queen size beds), full bath with handpainted tiles, living room, television, stereo, refrigerator, coffee maker, rooftop terrace, Alhambra views, near Sacromonte & flamenco. Optional access to professional kitchen. House rental, including two bedrooms, terraces, and kitchen. Casa Azahar is located in one of the most historic parts of the Albaycin, close to both cultural attractions and nature parks. Casa Azahar was completely renovated in 2006.
the area: "Granada has everything to offer, from the Alhambra and the Albaicin to the intimate corners of nineteenth century Romanticism; from the enchatment of Oriental art to the dawn of the Gothic; from the flowering of the Renaissance to the exuberant brilliance of the Baroque. And if, from the point of view of the Arts, this rich diversity is overwhelming in its vitality without the dominance of one unilateral theme, Nature for her part provides analagous contrasts. In some places there is ruggedness, in other a delicacy full of half-tones; here is a city neither of the mountain no of the plain. The Sierra and the lowland intertwine in a stange arabesque and this gives the landscape both strenth and extraordinary variety. From the foot of the mountains to their summit there is an ascent of more than three thousand meters and from the region of perpetual snow it is possible to descend, in barely an hour, to a coast where every tropical fruit abounds. It would be difficult to find a land richer in variety and contrasts or one evoking emotions of greater depth and diversity." getting here: Traveling to the historic city of Granada, Spain is easy. Options include direct flights, train, and car rental. Granada Airport is now served not just by Iberia, the national carrier, from Barcelona and Madrid, but also by Air Europa, Spanair, RyanAir, and Monarch Airlines as well, with direct flights from and to the United Kingdom. A taxi ride from the airport to the Albaycin is currently 25 euros. The RENFE train station is downtown. A taxi from there to Calle San Luis, about 5-7 euros. To see a detailed pdf map of Granada, click on the link below. Calle San Luis is located in quadrants 3 & 4 E. Calle Cruz de La Rauda is one street east of Calle San Luis. Casa Azahar's rental apartment entry is off of Calle Cruz de la Rauda, which is off Calle San Luis. Entry is by Plaza Cruz de Piedra (quadrant 3E). 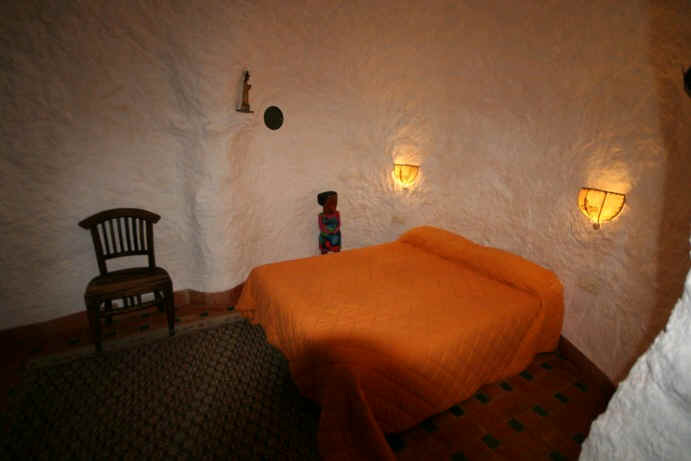 sustainable tourism: The Cave House -- Casa Cueva -- and kitchen cave provide natural and excellent insulating properties for energy conservation using a totally sustainable construction technique. payment details: We accept payment by check or cash, and major credit cards using PayPal. Charges and prices are in euros. We can also accept bank wire transfers. Please e-mail us for information. A 50% deposit (non-refundable after 7 days) is due upon making the reservation for your Granada vacation rental, and the balance is due 21 days before arrival. Most commonly, we will bill you using PayPal once we receive your request. Alternatively, you can make arrangements to send a check or bank transfer for the apartment.